Anne Frank was a Jewish victim of the Holocaust most well-known for the diary she kept while in hiding, which has since become one of the world's most widely read books. Frank (born June 12, 1929; died early March 1945) was born in Frankfurt am Main in Germany. In 1933, when the anti-Jewish National Socialist Party led by Adolf Hitler came to power, Frank's parents - Edith and Otto - realized that there was no future in Germany for the Jewish people. They quickly fled to the Netherlands that same year. The only existing film of Anne Frank shows her in the window of the second floor apartment gazing in the direction of the young couple walking down the street. Until around age eleven, Anne grew up without a care in a relatively safer Holland. In 1940, however, the Netherlands was occupied by Germany and the protection that Holland was able to provide to its Jewish citizens came to an end. Beginning in 1942, the first Jews in Holland received call-up notices to report for the so-called “work” camp Westerbork. The majority of Jews obeyed the call-up to report for the “work” camps as fleeing was almost impossible and refusal to obey could lead to death or shipment to prison camps. To avoid deportation or exile to the camps, Anne's parents went into hiding in the annex of the building that housed Otto's business. In order to protect Anne from the danger that threatened, them, Anne's father tells her only a few days before going into hiding that the family is not going to a camp but are instead going to stay and hide. On July 6, 1942, the Frank family went into hiding. Even though Anne saw hiding as an exciting adventure, the hiding place quickly became too small for her restless character. For more than two years, Frank described her daily life in hiding through writing. On August 4, 1944, the secret annex where Frank and her family were hiding was discovered and raided by the Grüne Polizei (Security Police). Anne and her family were arrested and are quickly deported to concentration camps in Holland, Poland, and Germany. The eight residents of the secret annex were transported to Auschwitz on the last train leaving the transit camp Westerbork. After a month at Auschwitz, Anne and her sister Margot were transported to Bergen-Belsen concentration camp, where thousands of people died everyday from hunger and sickness. Margot and Anne both contracted typhus and died within a short time of each other in March 1945, only a few weeks before the liberation. 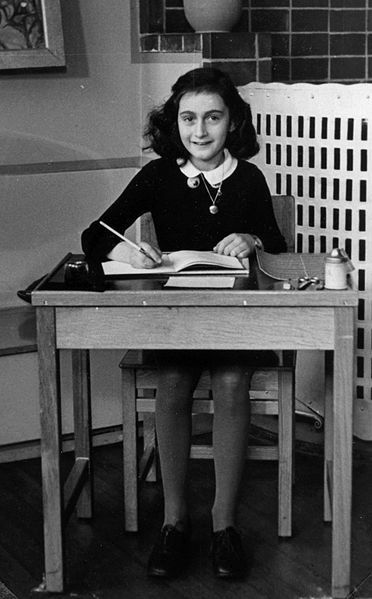 Of all those in hiding in the secret annex, only Anne's father - Otto Frank - survived the camps. He passed away in 1980. In November 2015 the Swiss foundation which owns the rights to The Diary of Anne Frank, the Anne Frank Fonds, added Frank's father, Otto, as a co-author. Otto was added as an author to extend the copyright of the work, which would have expired on December 31, 2015, 70 years after Anne's death. If the authorship change goes unchallenged, the new copyright will allow Anne Frank Fonds to retain control of publication of the diary until 2050. Legal experts advised officials at the Anne Frank Fonds that adding Frank's father Otto as a co-author was justified, because he helped put together the final draft of the diary and “created new work” by editing and reshaping it. Official Anne Frank YouTube Channel. “Anne Frank’s father made ‘co-author’ of diary in bid to extend copyright,” Jewish Telegraph Agency, (November 17, 2015).